While visiting the Middle East over Christmas break this year, I was introduced to a plethora of culinary delights. Every day the table was laden with gourmet delicacies of the highest quality including dates and pomegranates from Kuwait, olive oil from Tunisia, honey from Morocco, three types of feta cheese from Lebanon, and kumquats from Iran. My tastes buds were happily satisfied with the balanced combination of sweet and salty flavors that these foods provided. Each morning when I awoke, the breakfast table held a colorful dish made of beans, cumin, parsley, and tomatoes drizzled with olive oil. This dish is called Ful (pronounced "fool") Medammas in Arabic. In the States, it probably would be called a bean salad appetizer served with crackers before a dinner meal; however, in the Middle East it is served as a breakfast food. Originally Ful Medammas was made with dried beans that were soaked and cooked from scratch. However, canned beans, such as white beans (cannellini), fava beans or chickpeas work just as well. Beans are a nutrient dense food because they provide many vitamins and minerals and have very few calories. This is in contrast to a calorie dense food, such as potato chips or candy bars, which provides a lot of calories and very few nutrients. In addition, if your New Year's Resolution is to lose weight, beans are an excellent choice because they provide high fiber which can keep you satisfied longer. One cup of white kidney beans provides 11 grams of fiber. Ful contains the spice, cumin, and the herb, parsley. Not only can eating fruits and vegetables increase one's antioxidant intake but eating herbs and spices can as well. Three foods touted for their high antioxidant levels are blueberries, cranberries and sweet potatoes. Interestingly enough, about 1/2 teaspoon of cloves will contribute more dietary antioxidant than a 1/2 cup serving of blueberries or cranberries, while 1/2 teaspoon of dried oregano contains the antioxidant equivalent of 1/2 cup of sweet potatoes. Cumin not only provides flavor but also antioxidants and iron. Parsley also provides antioxidants and is rich in vitamin C which is important for a healthy immune system and can help prevent a winter cold. Eat a variety of herbs and spices to enjoy all of their health benefits, many of which scientists are just beginning to understand. For breakfast, serve Ful Medammas with flatbread, pita or whole grain crackers. If you want to be truly Lebanese, provide a separate plate of pickles, fresh mint, cucumbers, radishes, and olives on the table. In addition, our host provided three types of cheese: Halloumi cheese (a mozzarella-like cheese from Cyprus made from a mixture of goat and sheep milk), Labneh (a flavorful Lebanese soft cream cheese), and feta cheese from Greece. I enjoyed topping my whole grain cracker spread with ful and crumbles of feta cheese! I hope you enjoy this new twist on a healthy and unique high protein and low-fat breakfast. 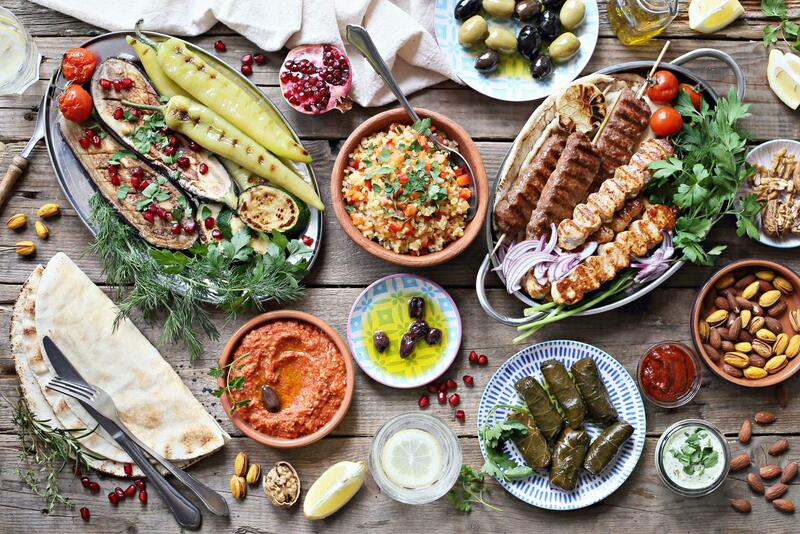 Try this high protein breakfast - Lebanese style today! Please let me know what you think and if you have any other tasty high protein low-fat breakfast ideas that you have learned while traveling. Martha M. Henze, MS, RDN, Traveling Taste Buds, LLC Martha is currently completing her Masters of Public Health (MPH) in global epidemiology and traveling around the world learning how to help people improve their health on a population basis. Drain and rinse a can of beans. Place in a serving bowl and mash with a fork. Add spices (garlic, cumin, and lemon juice) and mix well. Finely chop tomatoes and herbs. Add and mix well. Top with a garnish of a few tomatoes and sprigs of parsley. Serve with flatbread, toasted pita bread or whole grain crackers. Eat immediately or you can make it the night before and refrigerate before serving for breakfast or an appetizer. This recipe is entered and analyzed in MyNetDiary so you don't need to enter the above recipe from scratch. Instead, you can copy and edit the recipe easily by logging into MyNetDiary via the web program. Next, go to Community, and then search "Dietician" with "People" chosen in the drop down box. Click on "Dietician" link. Scroll down Dietician Personal Page and find Custom Catalog. Find "Ful Medammas (Martha's blog)" Copy recipe by clicking "copy" link on the right side of the screen. Once you do that, you can use that recipe in your own food log without having to enter it yourself. This recipe is also found in Dietitian account - so you can copy from either account. Note: If you have Maximum membership, you can copy and customize recipes or foods. In web program, go to Food tab, tap "Log" in any meal row, then tap MyFoods, find the food or recipe and then choose "copy & customize" option. You can modify any field to customize the recipe (ingredients, yield, name, etc.). Martha M. Henze, MS, RDN Martha is currently completing her Masters of Public Health (MPH) in global epidemiology and traveling around the world learning how to help people improve their health on a population basis.